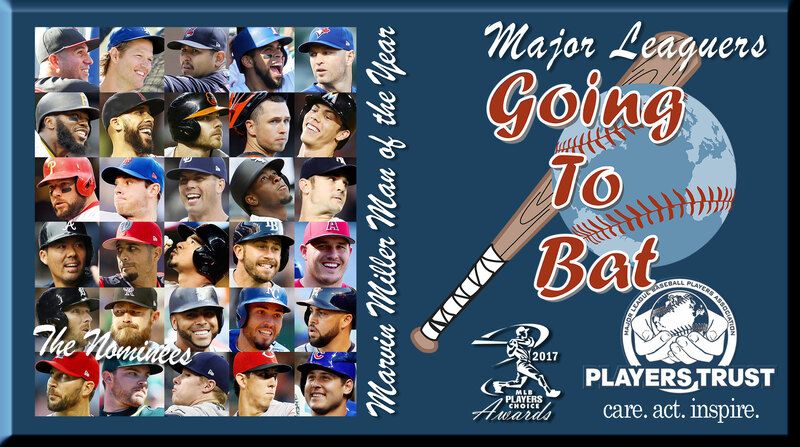 The 30 Major League Baseball players nominated by their teammates for the 2017 Marvin Miller Man of the Year award showcase the diverse range of causes, commitments and creative approaches to community service taken by the current crop of big leaguers. Fan voting is taking place through midnight Sunday on the MLBPA’s official site, www.mlbplayers.com, to determine the six finalists for the most prestigious of Players Choice Awards, which goes to the player whose on-field performance and contributions to his community most inspire others to higher levels of achievement. Each of the six division finalists chosen by the fans will appear on the Players Choice Awards ballot all players will fill out on Tuesday, Sept. 19, at ballparks across the country. In addition to the Marvin Miller Man of the Year, Players will select an overall Player of the Year, as well as the outstanding players, pitchers, rookies and comeback players in their respective leagues. The Marvin Miller Man of the Year is not just about performance, but also takes into account his leadership on and off the field. Past winners of the award named for the legendary MLBPA union leader, include Curtis Granderson, Adam Jones, Clayton Kershaw, Mariano Rivera, Chipper Jones, Michael Young, Brandon Inge, Torii Hunter, Albert Pujols, Jim Thome, John Smoltz, Mike Sweeney, Mark McGwire, Sammy Sosa, Eric Davis and Paul Molitor. Among this year’s nominees are players involved in providing clean water and other necessities to poverty-stricken villages in remote parts of the world, supporting the needs of servicemen and women and their families, building schools, ensuring clothing and meals for inner-city poor, raising funds for research and respite to cancer victims and their families, rescuing abandoned and mistreated animals, and sending truckloads of emergency supplies to victims of natural disasters. The 15 American League nominees are: JA Happ, Blue Jays; David Price, Red Sox; David Robertson, Yankees; Evan Longoria, Rays; Chris Davis, Orioles; Tim Anderson, White Sox; Carlos Carrasco, Indians; Eric Hosmer, Royals; Eduardo Escobar, Twins; Andrew Romine, Tigers; Nelson Cruz, Mariners; Liam Hendricks, A’s; Mike Trout, Angels; Robinson Chirinos, Rangers, and Carlos Beltran, Astros. The 15 National League nominees are: Steven Matz, Mets; Cameron Rupp, Phillies; Christian Yelich, Marlins; Gio Gonzalez, Nats; Kurt Suzuki, Braves; Michael Lorenzen, Reds; Chase Anderson, Brewers; Adam Wainwright, Cardinals; Anthony Rizzo, Cubs; Josh Harrison, Pirates; Buster Posey, Giants; David Peralta, Diamondbacks; Mike Dunn, Rockies; Clayton Richard, Padres, and Clayton Kershaw, Dodgers. Each of the nominees will receive a grant from the Players Trust for $2,500 to provide to the charity or charities he selects and the eventual winner will receive a $50,000 grant. The 2017 Players Choice Awards winners will be announced in November, with winners receiving grants totaling $335, 000 from the Players Trust. To date, the Players Trust has contributed more than $4 million to charities around the world personally selected by Players Choice Awards recipients.